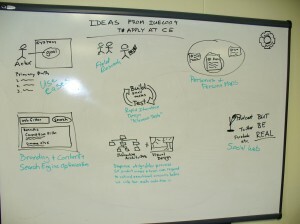 Whiteboard ideas cluster from IUE2009 conference. Click to view larger version. My employer, Covenant Eyes, sent a small crew of people to the conference…8 of us in all. For all but me, it was the first time at any UX conference, and I think we all learned quite a bit. So now the question becomes, what did we learn from all these tutorials and sessions, what ideas will help us do better work, and how can we make sure to build these ideas into our daily work. 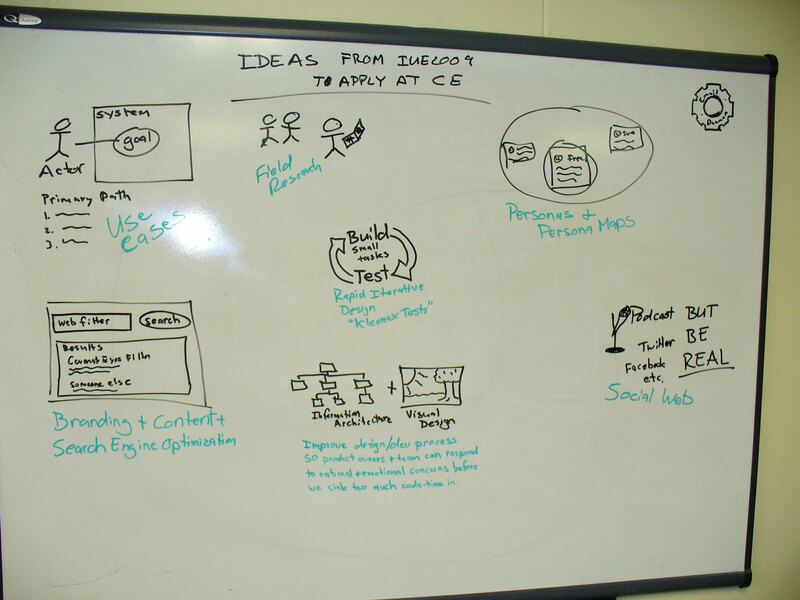 I understand that most of us will gather on Monday to start hashing out those questions, but in the meantime I thought I’d share my initial map of ideas, recently jotted onto my whiteboard. Click the photo for a larger, more readable version. Social Web (Podcasts, Twitter, Facebook, etc.) But Be Real! Thanks so much for buckling to my strong arm tactics and attending my session at the IUE conference. And thank you for the thumbs-up mention in your blog post. It was a genuine pleasure meeting you and the tribe at Covenant. Thanks Jan! I hope we cross paths again.